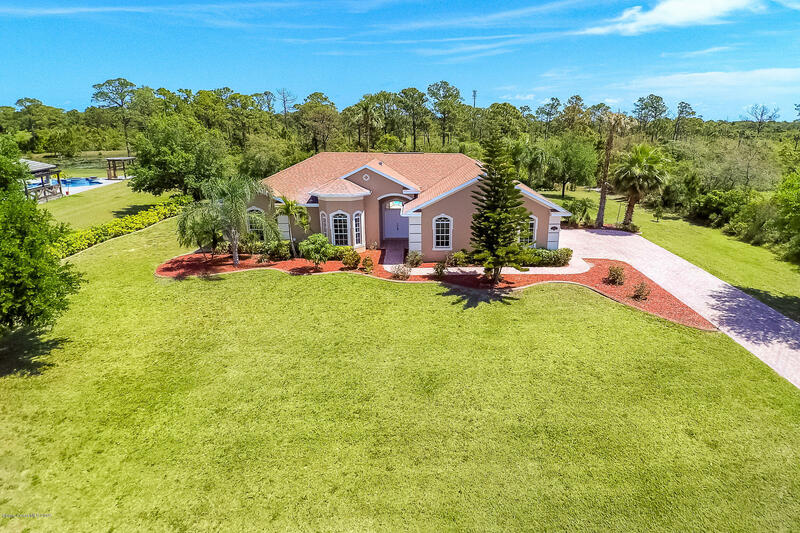 1947 Positano Drive, Malabar, FL.| MLS# 842448 | Free Brevard County MLS Home Search. No Agent Needed. Daily Auto-Email Listings of All Brevard County Homes and Listings For Sale That Meets Your Home Buying Criteria. Brevard County Real Estate Market Information. Serene Gated Executive Style Living! This Stunning 4 Bedroom, 3 Bath Pool Villa offers an abundance of 42'' Kitchen Cabinets w/ Granite Counter Tops, Fresh Interior and Exterior Paint, New Carpet, Ceramic Tile, and so much more! Front Breezeway Entrance opens to the Luxurious Courtyard Pool and Spa. Main house has 3 Bedrooms & 2 Baths with High Ceilings and Upgraded Plumbing & Light Fixtures,. Attached Villa offers a 670 sq ft 4th Bedroom/Office with En Suite Bath & Private Entrance. Perfect home for those needing a home office, an in law suite, or have trailing family members. Brick paver driveway leading to 3 Car Garage offering a plethora of parking. This 1.47 Acre lot backs to Preserve adding to Tranquility.! Deeded Conservation Community w/ city comforts nearby....DO NOT WAIT!